What is an AppGini project? An AppGini project is the starting point for your work. The project is where you describe and design your database tables and fields, and define your application's appearance and behavior. After you finish working with your project, you just click the Generate button on the toolbar or press F5. AppGini then generates all the PHP code for your application and saves it to a folder of your choice. You can then upload the generated files to your web server using any FTP client. Start AppGini, then from the File menu, choose New. You can also click the 'New Project' icon on the tool bar. A new project window will appear, as shown below. 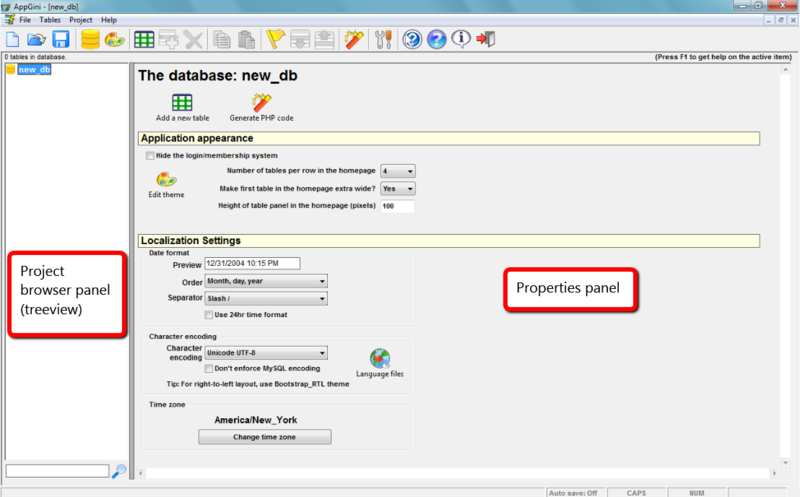 The database has a default name of 'new_db'. To change it, click on the database name in the left panel, then press F2 and type the new name. This name is used for identification only and is not related to the actual database name on your server, which you can configure later during generated application setup. This is your working area. This window has two panels: the Project Browser panel at the left lets you view your project contents (the database, tables and fields) in an easy to navigate hierarchical manner. The right panel is the properties area. When you click on any item in the Project Browser panel, its properties are displayed in the properties panel. In the professional version of AppGini, projects can be saved as .AXP files and opened later. The freeware version can open project files but can not save changes to them.